Our mom loved corned beef and cabbage, and made it year-round in addition to St. Patrick’s Day. There were corned beef sandwiches for lunch the next day, and corned beef hash for Saturday breakfasts (Sunday was always bagels and lox). But our younger brother, a fussy eater, refused to try it, claiming it looked like dog food. If only Mom had thought to turn the hash into patties, like the folks at Idaho Potatoes; or to shape it in a food ring mold, like they do at Murray’s Cheese Bar. The recipe for the patties follows. If you want to make the hash in a ring, here’s a recipe; you can follow the Eggs Benedict preparation or just make the hash. 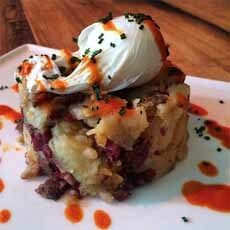 And here’s another recipe, for Corned Beef Hash Eggs Benedict. Instead of cubed potatoes and corned beef, the potatoes are riced, and the corned beef cubes embedded within. The result: smooth patties. Edward, this recipe is dedicated to you. 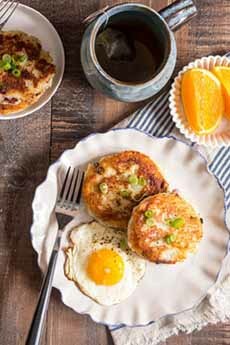 A new way to serve corned beef hash: in neat patties (photo and recipe courtesy Idaho Potatoes). Classic corned beef hash shaped in a ring and topped with a poached egg, at Murray’s Cheese Bar. 1. PREHEAT the oven to 200°F. Place the potatoes in a large pot, add 2 tablespoons of salt, fill with cold water and bring to a boil over medium-high heat. Cook until the potatoes are fork tender about 20 minutes. Drain well and place the potatoes back into the pot to cool for 10 minutes. 2. USE a potato ricer or grater to rice the potatoes into a large bowl (you should have about 4 cups of riced potatoes). Add the cubed corned beef, chopped scallions, milk, egg and optional parsley to the potatoes, and stir well to combine. Season with salt and pepper. 3. HEAT a cast iron skillet skillet over medium heat with about ¼ cup of vegetable oil, and form ½ cup of potato mix into a round patty. Fry for 3-4 minutes per side or until it’s a nice medium gold color on each side. Make sure you place no more than 3-4 potato patties at a time in the frying pan. 4. TRANSFER the cookie patties to a paper towel-lined baking sheet to drain any excess oil. Season with more salt as desired (or allow for salt and pepper seasoning at the table). 5. KEEP the cooked patties warm in the oven as you cook the eggs. Serve the patties hot as soon as the eggs are ready.